Combined X-ray absorption, UV-Vis spectroscopy, and DPS voltammetry analysis. Figure 1: Schematic structure of humic acids (HAs) - natural carbon-rich biopolymers, ubiquitous in terrestrial and aquatic environments. Figure 2: UV-Vis curves of spectrophotometric titration of K2CrO4 solution before and after addition of HAs. The dashed line represents the spectrum of trivalent chromium. Figure 3: a) Normalized Cr K-edge profiles displaced vertically, K2CrO4 solution before and after addition of HAs and reference samples with Cr valence state 0, 3+, 5+ and 6+. The energy scale is set relative to the Cr K-edge in metal (5989.0 eV). (b) Fourier transforms of Cr EXAFS spectra (experiment: solid line; best-fit EXAFS model with FEFF6: dashed line). Published as: “Soil humic acids may favour the persistence of hexavalent chromium in soil”, Environmental Pollution 157, 1862 (2009). Chromium occurs naturally in the Earth’s crust in various oxidation states ranging from 0 to 6+. After entering the soil, hexavalent chromium Cr6+, being a strong oxidant, can be readily reduced to trivalent chromium Cr3+ in the presence of various electron donors, including soil organic matter. Cr3+ readily precipitates or becomes immobilised after sorption onto soil colloids. However, it is known that Cr6+ may persist, especially in organic soils, for prolonged periods of time, even years. 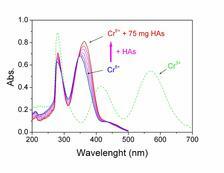 Our work focused on the elucidation of the possible interaction of Cr6+ with humic acids (HAs) by complementary analytical techniques: X-ray absorption spectroscopy (XANES, EXAFS), UV-Vis spectroscopy, and DPS voltammetry. The results show that HAs does not induce reduction of Cr6+ to its trivalent chemical form. The interaction between Cr6+ and HAs rather leads to the formation of Cr6+–HAs chemical adducts via supramolecular chemical processes, which can explain the relatively high persistence of ecotoxic hexavalent chromium in soils. The presence and fate of chromium in the soil system is of concern mainly due to the high toxicity and carcinogenicity of the hexavalent form (Cr6+). Even though naturally elevated levels of Cr6+ can be found in some soils (e.g. Arizona, Chile) distressing amounts of Cr6+ in soil are largely restricted to sites contaminated by human activities. After entering the soil, Cr6+ remains thermodynamically metastable in the pore solution and is generally much more mobile in soil than Cr3+. Hexavalent chromium, a strong oxidant, can be readily reduced to Cr3+ in the presence of electron donors. However, even when dealing with propitious soil composition and favourable physical conditions, Cr6+ may persist, especially in organic soils, for prolonged periods of time, even years . Humic acids (HAs) are carbon-rich polydisperse polyanionic biopolymers (Fig. 1). Their basic binding block consists of a hydrophobic framework of aromatic rings with various functional groups, all interlinked together by more flexible carbon chains. 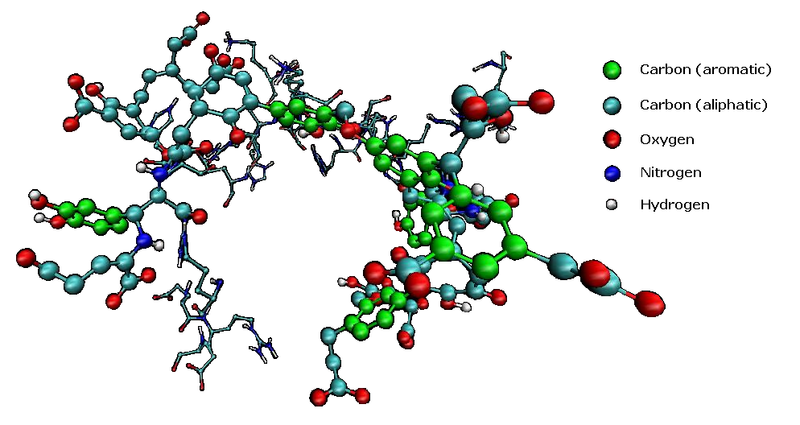 Chemically, HAs behave as supramolecules which are able to polymerise and aggregate, to form micelles and also to form supramolecular ensembles with other compounds. HAs represent a strongly pH-dependent reservoir of electron donors / acceptors, which can hypothetically contribute to reduction of several inorganic and organic contaminants. HAs can therefore affect the uptake, bioavailability, transport, fixation and toxicity of xenobiotics in the environment . In this research, we focused on the elucidation of interactions of Cr6+ with standard HAs under sub-neutral conditions using complementary analytical methods: UV-Visible (UV-Vis) spectroscopy, X-ray Absorption Near Edge Structure (XANES), Extended X-ray Absorption Fine Structure (EXAFS), and Differential Pulse Stripping (DPS) voltammetry. The UV-Vis spectra of K2CrO4 water solution at pH 6.5 without and with added increasing concentrations of HAs were recorded in the region between 200 and 600 nm, where the main chromate absorption bands occur (Fig. 2). 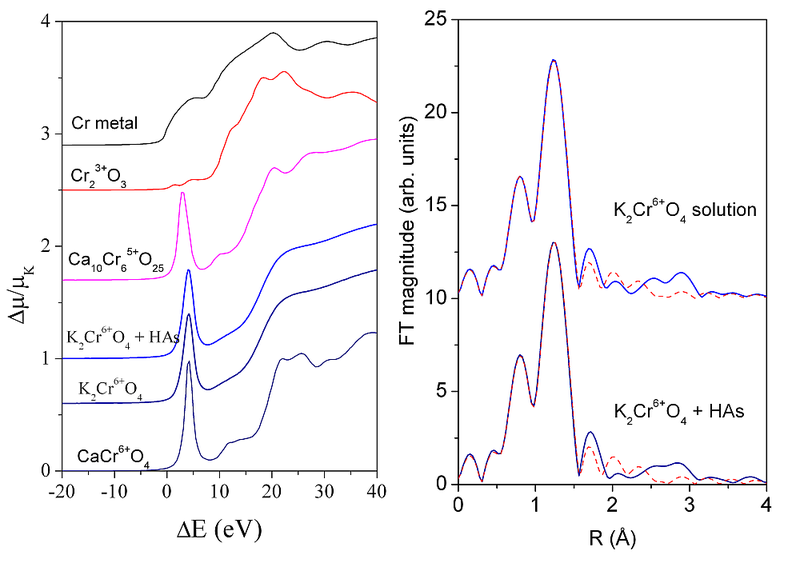 The spectra revealed two intense absorption bands at 277 nm and 351 nm, characteristic for O–Cr6+ electronic charge transfer of chromate species in a tetrahedral conformational structure . Both peaks increased in intensity with increasing levels of HAs, and they shifted to higher wavelengths by 4nm and 13nm, respectively. We did not observe any absorption bands at 425 nm and 583 nm, characteristic for the Cr3+ oxygen octahedron. These responses indicated that HAs promoted the probability of intramolecular O–Cr6+ electronic charge transfer together with an energetic benefit, without inducing reduction of Cr6+ to Cr3+. In addition, the results of DPS voltammetry, obtained during a stepwise addition of HAs to K2CrO4 solution showed a strong interaction of CrO42--complex with HAs, which indicated the formation of Cr6+–HAs micelles (data not shown). X-ray absorption spectroscopy was used to directly probe the O– Cr6+ charge transfer and eventual structural distortion of tetrahedral chromates because of interaction with HAs. 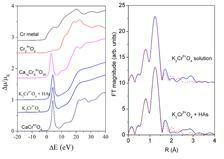 X-ray absorption spectra of K2CrO4 solution at pH 6.5 with or without HAs were measured in the energy region of the Cr K-edge in transmission mode at beamline E4 at DORIS III (Fig. 3a). The characteristic pre-edge line-shape clearly indicated that Cr in solution remained tetrahedrally coordinated. From the energy position of the pre-edge peak and from the Cr K-edge profile we could deduce that the valence state of chromium in the samples was Cr6+ [4,5]. 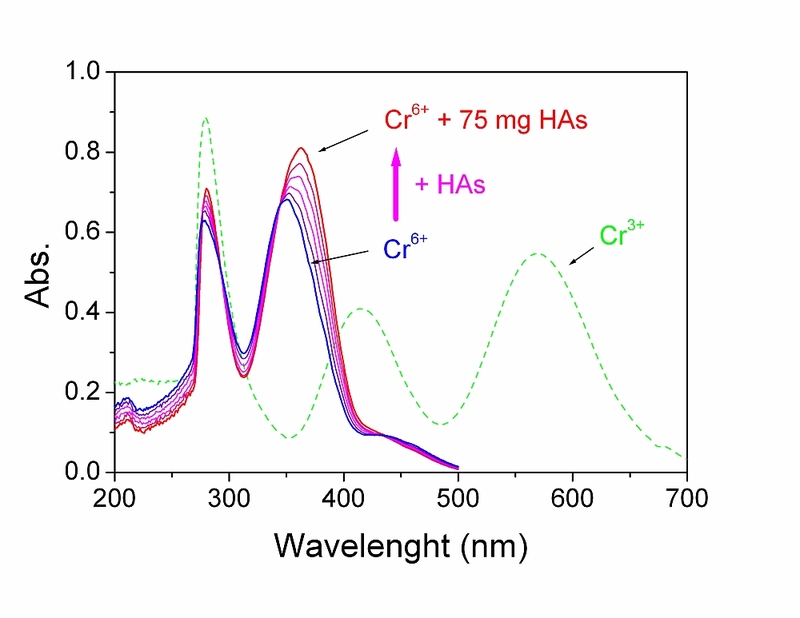 The spectra of chromate with and without HAs were identical within the noise level, which clearly demonstrated that local symmetry and valence state of hexavalent Cr in the aqueous solution did not change due to interaction of CrO42- with HAs. In order to verify whether the interaction between HAs and CrO42- involved any structural modifications, we analysed Cr K-edge EXAFS spectra using the IFEFFIT  and FEFF6  program packages. The comparison of the EXAFS spectra of K2CrO4 solution before and after addition of HAs did not show any structural changes in the local Cr neighbourhood: Both spectra were identical within the noise level. Fourier transform of EXAFS spectra (Fig. 3b) exhibited a single peak. The Cr K-edge EXAFS results therefore clearly showed that interaction with HAs did not induce any structural modifications of the CrO42--complex. From these results, we can conclude that presence of HAs did not favour reduction of Cr6+ to Cr3+. In fact, the zwitterionic character of HAs could putatively allow formation of chemical adducts [HAs – Cr6+] which hinder the reduction of Cr6+ to Cr3+. The reported observations could contribute to the explanation of the relative persistence of Cr6+ in soils. C.D. Palmer, P.R. Wittbrodt, "Processes affecting the remediation of chromium-contaminated sites", Environ. Health Perspect., 92, 25 (1991). P.A. Campitelli, M.I. Velasco, S.B. Ceppi, "Chemical and physicochemical characteristics of humic acids extracted from compost, soil and amended soil", Talanta, 69, 1234 (2006). K. Takehira, Y. Ohishi, T. Shishido, T. Kawabata, K. Takaki, O. Zhang, Y. Wang, "Behavior of active sites on Cr-MCM-41 catalysts during the dehydrogenation of propane with CO2", J. Catal., 224, 404 (2004). A. Pantelouris, H. Modrow, M. Pantelouris, J. Hormes, D. Reinen, "The influence of coordination geometry and valency on the K-edge absorption near edge spectra of selected chromium compounds", Chem. Phys., 300, 13 (2004). I. Arčon, B. Mirtič, A. Kodre, "Determination of Valence States of Chromium in Calcium Chromates by Using X-ray Absorption Near-Edge Structure (XANES) Spectroscopy", J. Am. Ceram. Soc., 81, 222 (1998). B. Ravel, M. Newville, "ATHENA, ARTEMIS, HEPHAESTUS: data analysis for X-ray absorption spectroscopy using IFEFFIT", J. Synchrotron Rad., 12, 537 (2005). J.J. Rehr, R.C. Albers, S.I. Zabinsky, "High-order multiple-scattering calculations of X-ray-absorption fine structure", Phys. Rev. Lett., 69, 3397 (1992).